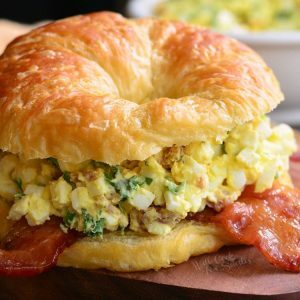 Combining egg salad, bacon, green onions, herbs, on a buttery, flaky croissant is a fabulous way to dress up all those leftover hard boiled eggs. Hard boiled eggs: bring water to boil in a medium pot (enough to cover the eggs). Add eggs carefully, using a large spoon, so you don't crack the eggs. Cover, boil for about a minute and turn off the heat. Leave the pot on the same burner but with heat turned off. Let eggs sit in the pot, still covered, for about 20-25 minutes. This method has not failed me yet but you are of course free to use your method of making hard boiled eggs. Dice crispy cooked bacon strips and add to the mixing bowl. Add green onions, parsley, garlic powder, salt, and black pepper. Gently mix until ingredients are evenly mixed. Add mayo and fold it in until it's evenly incorporated.